Ann Carol Designs is an independent jewelry maker run by Janet Schroeder of Bound Brook, New Jersey. 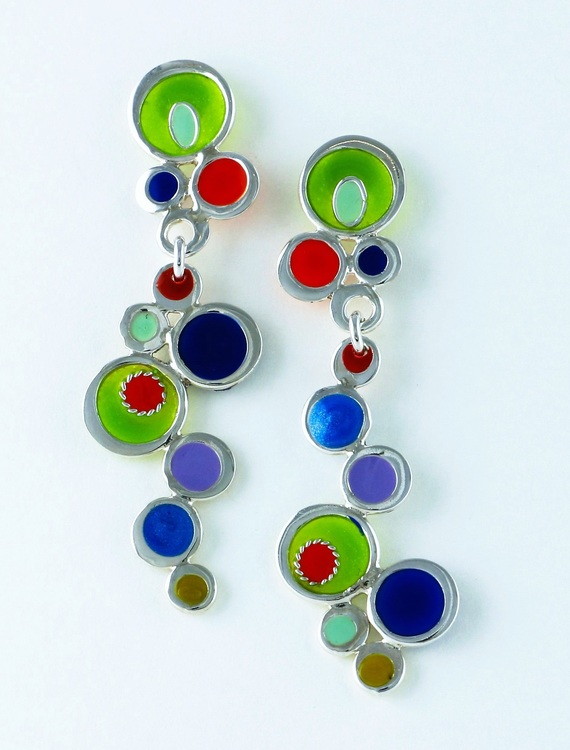 Schroeder began learning the art of silversmithing in high school, and she began learning about resin enamel in 1999 when she met Carol Baretz. Together, the two began creating unique and colorful jewelry pieces that incorporated both of their areas of expertise. Today, jewelry from Ann Carol Designs begins with a sterling silver base, and then features hand-painted resins created with minute, intricate detail. Each piece is handmade and many take quite a few cycles of painting and drying to complete, which creates what Ann Carol Designs refers to as “wearable art.” With bright, primary colors decorating interlacing circles on dangling earrings, pendants featuring tiny swirls of pattern and colorful dragonfly shapes and cuff bracelets displaying abstract art designs, Ann Carol Designs creates uniquely wearable jewelry.